As we transition from the activity of Summer to a slower pace in the season of Fall, it is crucial to listen to our body and support our immune system. This transition from Summer to Fall can be especially challenging because of the big temperature change, resulting in more vulnerability to bacteria and viruses in our environment. Often times, we feel the change into Fall with a slight tickle in the throat accompanied with physical and emotional fatigue. The good news is that there are steps we can take to combat the less welcoming aspects of Fall, so we can focus on the good stuff; cozy sweaters, time indoors with dear friends and family, creative exploration, and delicious stews. One of my favorite ways to bolster my immune system and transition smoothly to Fall is with medicinal mushrooms! Medicinal mushrooms have been used throughout human history for their energy and immune boosting effects. In my eyes, if the immune system is working efficiently, we will have the resilience to meet the myriad of viruses and bacteria that we so often come across in the beginning of Fall. What’s more, the support that the body gains from an immune tonic like medicinal mushrooms means that it will be using less energy fighting these pathogens off. That means that you will experience greater overall energy. When we have more energy, we are able to express ourselves in the world and live our lives to our fullest capacities. Today I would like to give a brief summary of three of my favorite medicinal mushrooms. Turkey Tail, Lion’s Mane, and Reishi. Turkey Tail (Trametes versicolor) is a shelf fungi that grows prolifically in forests. You can find it in our Pacific Northwest forests, draping itself over tree stumps in all its silvery, shimmering beauty. This is one of my absolute favorite mushrooms to use for immune wellness. Turkey Tail’s claim to fame was in a research study done on breast cancer patients who were undergoing chemotherapy. Results showed that the patients who were taking the turkey tail had enhanced immune function in comparison to those who were given a placebo. I find that daily use of turkey tail provides greater energy, less instances of sickness and a generalized feeling of well being. Lion’s Mane (Hericium erinaceus) is a highly medicinal mushroom which can also be found in the Pacific northwest. This mushroom has a ghostly white color and has an interesting growth pattern which often looks like dangling spines. The amazing thing about Lion’s Mane is that regular consumption of this medicinal has been shown to stimulate nerve growth factor (NGF) which is critical for the growth, maintenance and survival of nerve cells in our brain, called neurons. Healthy neurons are sheathed in something called myelin, a fatty tissue which insulates the nerve and allows for the smooth transfer of information in the brain. NGF helps to repair myelin, preventing us from scattered thinking and memory loss. What’s more, Lion’s Mane can help to promote a healthy immune response, lift depression and relieve anxiety. 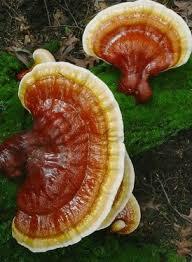 Reishi mushroom (Ganoderma lucidum) is one of the most celebrated medicinal mushrooms in history. With its glossy shell, and caramely red color, reishi is a treasure to be found in the woods. This mushroom can also be found in the Pacific Northwest! Reishi has a myriad of health benefits. It has been shown to lower blood pressure, quell allergies and fight respiratory ailments, increase energy, help the body to fight cancer, and promote a healthy immune response. This is a general tonic that can be safely taken every day and generally just helps our body to function better. Have more questions? I would love to help! Disclaimer: The Author does not provide any medical advice on the Site, and the Information should not be so construed or used. Using, accessing and/or browsing the Site and/or providing personal or medical information to the Author does not create a physician-patient relationship between you and the Author. Nothing contained in the Site is intended to create a physician-patient relationship, to replace the services of a licensed, trained physician or health professional or to be a substitute for medical advice of a physician or trained health professional licensed in your state. You should not rely on anything contained in the Site, and you should consult a physician licensed in your state in all matters relating to your health. You hereby agree that you shall not make any health or medical related decision based in whole or in part on anything contained in the Site. While Authors make every effort to broadcast correct information, we are all still learning. We will double check all facts but realize that medicine is a constantly changing science and art. One doctor may have a different way of doing things from another. We are simply presenting views and information to the best of our knowledge. We welcome any comments, suggestions, or correction of errors. No author takes money from drug, herbal or device companies. This information is not intended as medical advice to treat any medical condition in either yourself or others, including but not limited to patients that you are treating. Consult your TCM practitioner or physician for medical issues that you may be having. This entire disclaimer also applies to any guests or contributors to the blog. Under no circumstances shall Joyful Living, Joyful Living practitioners or any guests or contributors to the blog, or any employees, associates, or affiliates of Joyful Living LLC be responsible for damages arising from use of the blog. This blog should not be used in any legal capacity whatsoever, including but not limited to establishing “standard of care” in a legal sense or as a basis for expert witness testimony. No guarantee is given regarding the accuracy of any statements or opinions made on the podcast or blog.